Our Swing Set Safety Commitment! At Kids Creations, we consider every angle - literally. Each play structure is carefully designed and manufactured with a set of rigorous safety guidelines in mind. Everyday, we make the safety of your children our #1 priority; by carefully evaluating and testing each swing set before ever reaching your backyard. As a testament to our dedication to safety, we are proud members of ASTM International a globally recognized organization that sets specific standards for product materials and testing as an assurance of enhanced quality and safety. 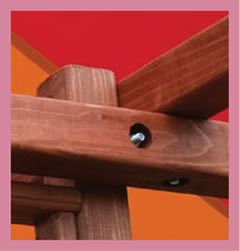 Recessed Bolts & Hardware - All bolt connections are recessed, ensuring no cuts, scrapes or torn clothes! Rounded Corners & Edges - virtually splinter-free! At Kids Creations, we make your child’s safety our first priority. We invest considerable time, effort and research to eliminate any possible hazards in order to ensure a safe play environment. From the safety grip handles and interlocking flat steps, to the recessed bolts and smooth rounded corners, no detail is left uncovered. Our specially engineered wood staining process further demonstrates our commitment to safety. When we couldn’t find a stain to meet our expectations and strict adherence to safety, we had one engineered specifically for us. All Kids Creations wood components are specially treated with our very own Wood Glow Semi-Transparent Stain and Sealer that not only enhances the look and longevity of our product, but is 100% safe and free of harmful chemicals to children. You can rest assured knowing we have taken every precaution necessary to guarantee that the swing set your children enjoy in your backyard is safe, durable and secure. Swing sets are designed for fun, imaginative play and recreation, but the combination of a swing set and all of its accessories paired with active, playful and daring children, can sometimes lead to accidents. While we follow strict safety guidelines when designing our swing sets, it is ultimately up to parents and adult supervisors to provide those all-important watchful eyes. After the installation of your swing set is complete- and once you can get your children to calm down from excitement- make sure to review some ground rules. Clarify the rules and the importance of having them, make sure the kids understand that swing sets are for fun, but are also complex structures that need to be treated with respect and used with caution. Our swing sets are designed to be as safe as possible and when used properly, a swing set from Kids Creations will provide years of safe outdoor fun and recreation for kids of all ages.